VATSIM April 26th Friday Night Ops (FNO) - The ROBUC Stops Here! VATSIM Friday Night Ops (FNO) - The ROBUC Stops Here! VATSIM Friday Night Ops (FNO) is a weekly VATUSA hosted event for VFR & IFR flights. This week we take part in FNO: The ROBUC Stops Here! Canadian Xpress® would like to invite all pilots to join us on Friday, April 26th, 2019 at 21h00edt (Saturday 01h00z) where we will depart from Halifax (CYHZ) and fly to Boston (KBOS). 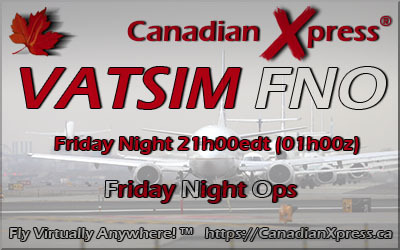 Every pilot that flies 26 Canadian Xpress® VATSIM FNO events will receive the Canadian Xpress® Friday Night Ops Award that will appear in their Pilot Details section of the Pilot Roster. To view the current statistics for the Canadian Xpress® Friday Night Ops Award, click the Statistics link that is available via the Operations menu. Do you want to participate in VATSIM Friday Night Ops but you are not sure where to start? The Friday Night Ops Tutorial is available by clicking the How to Fly Friday Night Ops link that is available via the Training menu. On-line training is also available by selecting the How to Fly Friday Night Ops course and completing an on-line training request. These events are a great time and will put your skills to the test. So choose your favorite Canadian Xpress® aircraft and join us this Friday night on the Canadian Xpress® TeamSpeak3 Server for a lot of fun!